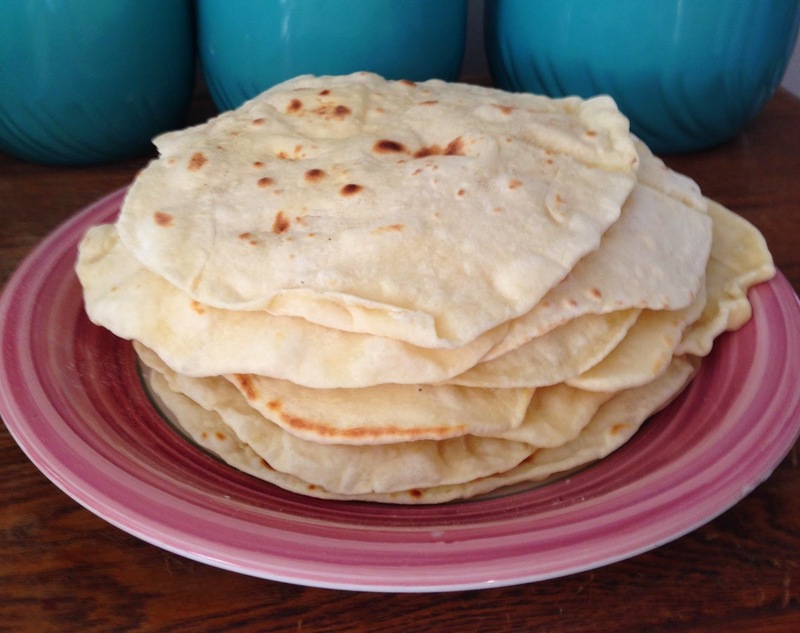 How to Make Flour Tortillas - Only 5 Ingredients, So Easy! When I found out how easy it was to make homemade flour tortillas, it revolutionized our taco life. I told you before how much the SSL Family Dad loves tacos. Well he loves them even more on homemade tortillas. They're softer, they taste better and they only have five ingredients. We've said goodbye to the remaining 15 chemicals that are in our store-bought tortillas forever and that makes me one happy cooking mama. 1. Combine dry ingredients and coconut oil in a mixing bowl and stir. 2. Add milk and stir. Dough will form into a ball. 3. Sprinkle flour on your surface and knead dough for two minutes. 4. Place dough back in mixing bowl and cover with a damp towel. Let sit for 30 minutes. 5. Divide dough in half by twisting apart. Divide each half into five equal balls of dough for a total of 10 balls of dough. 6. Place balls of dough on a plate and cover with damp towel. Let sit for 10 minutes. 7. Heat skillet on medium. 8. Lightly flour your surface and rolling pin. Roll each ball into 8" discs. 9. Cook tortillas approximately 30 seconds on each side. Bubbles will form, you can pop them if you'd like to make the tortillas cook more evenly. That's it! So easy and they taste great. We use them for sandwich wraps, too. I usually make a double-batch at a time for our family of five. They last 5-7 days in an air-tight container in the refrigerator. I usually pop them in the microwave before making sandwiches if they've been stored in the refrigerator. I loved how simple this recipe is and your video is awesome! I chose your post as one of my February Favorites for the Country Fair Blog Party. I hope you share again in March. The Blog Party goes live on my blog, Corn, Beans, Pigs & Kids, tomorrow morning at 6am and will be open all month. I loved your taco seasoning recipe from a while back and I love this one too! Tacos are great on tortillas and I bet even better on homemade ones. Thanks for sharing!